Allyson Longueira, the publisher of WMG Publishing, asked me to tell everyone about the new online workshop. So here I go. Starting in September, WMG Publishing workshops will offer a new online workshop called Speed. It’s not about running or driving or flying faster. Nope, this workshop will help writers write faster and at the same time with better quality. For those of you who didn’t know, WMG Publishing Inc. not only does a series of books for writers, but also online lectures and online workshops to help writers with craft and business. The Speed online workshop will be the newest one on the list, and it’s going to do more to help writers than most other workshops WMG Publishing sponsors. The workshop might only help a writer get a hundred words per hour faster. Or it might help the writer get three hundred or more words per hour faster. Any extra words can really add up over time into more novels that readers want to read, especially if the writing maintains a higher quality. USA Today bestselling writer Kristine Kathryn Rusch and I will put this together, but I will be the one doing the talking on the videos and answering questions. The workshop will be six weeks long, with five to seven videos to watch at your own pace each week. Also, there is an assignment each week to help you work on some of the topics being talked about. Most writers find they spend about three hours per week on the workshop, so lots of time for your writing and regular job. WMG Publishing already has a workshop called Productivity, to help writers get to the computer more often to write. But this Speed workshop will focus only on the actual writing part of things. So if you are interested in signing up for the new Speed workshop, or want to look at any of the other online workshops and lectures available for writers, stop by www.wmgpublishingworkshops.com. And if you have any questions about the workshops, feel free to write me directly through my web site at www.deanwesleysmith.com. Keep having fun with your writing. 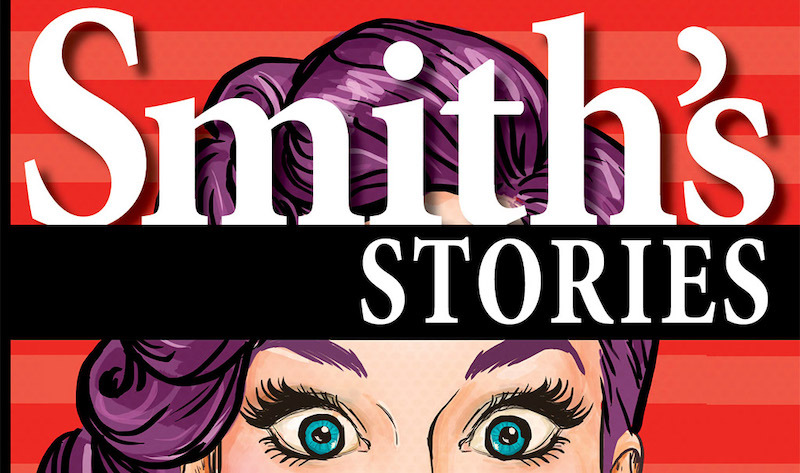 Many people know WMG Publishing for its fantastic Fiction River anthology series with more than eighty different authors, or the great Kris Nelscott mystery novels, or the Kristine Kathryn Rusch groundbreaking Retrieval Artist novels, or my strange and fun Smith’s Monthly project. WMG Publishing also does a series of nonfiction books on the business of being a freelance artist in our world, including the massive must-read industry bible, The Freelancer’s Survival Guide. But WMG Publishing also has a side to it that many writers know about, but not many readers or fans have heard of. That side is the online workshops and lectures. At the moment, WMG Publishing has twenty-two different video lectures on the business and craft of fiction writing, and seventeen online six-week video workshops. The video lectures are available any time you would like and you can return to the lecture over and over as you need. And new lectures are being posted most every month. The six-week online workshops cycle through ten different workshops each month. WMG limits each workshop to twelve writers and each member of the workshop gets personal feedback from me on five different assignments over the six weeks. Sounds like a lot of time to commit to a workshop, but writers will spend only four hours per week at most. This month is the second-year anniversary of starting the online workshops, and everyone at WMG Publishing is proud of the knowledge that writers get from the various workshops and lectures. We hope to add in more workshops as time goes by to keep them fresh and informative to those trying to learn the craft and the business of fiction writing. There is one more very special thing going on with the online workshops in October. Since WMG Publishing is doing a subscription drive for Fiction River through Kickstarter (you can get the details at Kickstarter Fiction River Subscription Drive), everyone at WMG Publishing thought it would be fun to combine the workshops and the subscription drive. So, if you sign up for an October online workshop, you get your choice of three electronic volumes of published Fiction River anthologies or a three-volume electronic subscription as part of the deal. You can also give the workshop as a gift to a writer friend, or the subscription as a gift to a favorite reader friend. So now the news about the WMG Publishing online workshops and lectures is out there. After two successful years of doing the workshops and lectures, we figured it was time to let people know that WMG Publishing had yet another side to it. A wonderful side dedicated to helping improve the craft and business of fiction writers from all over the world. Hope to see you in a workshop down the road. Dean Wesley Smith is a USA Today bestselling author, instructor, and facilitator for the WMG Publishing online workshops and lectures. Allyson Longueira, the wonderful publisher of WMG Publishing, asked me to do a guest blog about Fiction River: Time Streams. The volume appears this next week and is full of great stories that I had the pleasure to select. I can’t begin to tell you how proud I am of the volume. But that makes me a normal editor, proud of his work like a parent is proud of a child. So instead of going on about that, and the great stories, as you might expect me to do, I’m going to leave the discovery of the wonderful stories in Fiction River: Time Streams up to you. What I’d like to yammer on about here is time in general. None of us ever have enough time. That’s just assumed as a way of life. And it seems to work double around publishing houses where everything takes twice as long as planned and time deadlines don’t allow that extra time to happen. How’s that for a Catch 22? Trust me, it’s standard in publishing (and many other industries I’m sure). I love time travel stories because it allows me to escape a lot of aspects about time that I don’t much like. A great time travel story allows me to leave the ticking clock of aging for a short trip to my youth. A great story can allow me to go back and change something that happened in my past that I wish I could change. And a great story can take me out of this time and deposit me safely in another world, another place, and yes, another time. Time in real life seems like a constant to all of us, even though it often feels like a variable. But in great time travel stories, time is the real flexible element, the part that you can play with as a writer in ways that are not possible in real life. I love that about all time travel stories. I suppose that’s why I write so many of them. Almost a year ago we started the idea of Fiction River, a series of varied anthologies that people could buy or subscribe to. The publishing date of Fiction River: Time Streams seemed a long ways away. None of the stories were even written yet, and many, many things had to happen at different times during the last year to get us to this point. But now, as time sweeps us all forward, Fiction River: Time Streams is now appearing. It will be available for years to come for new readers to find and enjoy the great stories in it. But I would suggest you grab it now, as it goes past in the flow of time. Trust me, the time spent to read the stories will be very much worth it. And, of course, that’s another entire subject: The value of time. Hmmm, maybe that should be a subject for another Fiction River anthology. I wonder what would happen if we let a group of professional writers loose on that topic. Time is that way, full of possible events. But one thing is very certain. There are some great stories in Fiction River: Time Streams of possible futures and different pasts. PS: If you would like to sample a free audio selection out of Fiction River: Time Streams for a few short days, Scott William Carter’s great story, The Elevator in the Cornfield, is now up here. But time is very fleeting on it. Go listen now. Fiction River: Time Streams is available in ebook at Amazon, Barnes & Noble, Kobo, iTunes and Smashwords and trade paperback from your favorite booksellers. The audiobook will be available in September. 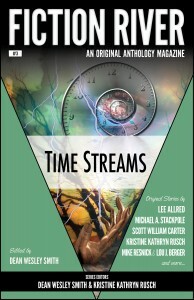 Dean Wesley Smith is series co-editor of the Fiction River series and the volume editor of Fiction River: Time Streams.